Summary: We need to be persistent in our prayers. There’s a magazine cartoon that shows a little fellow kneeling beside his bed for his bedtime prayer. He says with some measure of disgust, "Dear God, Uncle Jim still doesn’t have a job; Sis still doesn’t have a date for the social; Grandma is still feeling sick - and I’m tired of praying for this family and not getting results." It seems that praying was a problem for this little fellow and he’s not alone. Prayer is a problem for a lot of people. If it’s not a problem, then why is it that there are so few people who take prayer seriously? 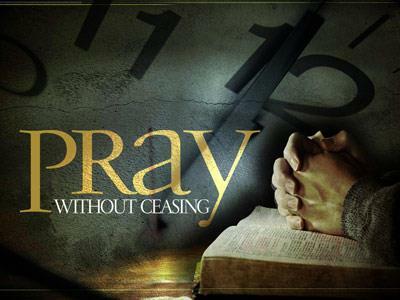 If it’s not a problem for us, then why do we find it so hard to set time aside every day to spend with God in prayer? If we took prayer seriously then we wouldn’t hesitate to be persistent and consistent in the time we spend in conversation with God. And if you think that this is just a problem for our day and time, think again. Why would Jesus have told parables about prayer to his disciples? Why would he have given them the Lord’s Prayer as a model prayer, if nobody had any trouble with prayer? Prayer is not just a modern problem - it has always been a problem for anyone who believes in God. If we really believe in the power of prayer, if we really believe that prayer can make a difference regarding the affairs of this world, if we’re truly convinced that prayer changes things, changes us, heals broken lives and restores severed relationships, then we would be praying constantly. You couldn’t keep us from praying. But the problem that most of us have with prayer is one that Jesus addresses in Luke 18. We simply lose heart. Maybe there was a time in our lives when we thought prayer was effective. But we’ve been disappointed. Huckleberry Finn heard about prayer and put an empty shoebox under his bed, prayed to God to fill it by morning, and, when the box remained empty, said that was it showed that prayer doesn’t do any good. We lose heart. This parable has two main characters. First of all, there is a judge who had no fear of God and cared even less what men said. This was a proverbial saying in Christ’s day to describe someone of questionable character. And so the picture of the judge here is one who was godless and unsympathetic. He simply lived for himself — a rather accurate picture of many judges in Christ’s day. There were many corrupt judges in Jesus’ day who accepted bribes and gave favors to people who held position and authority. You recall that Felix did that in Acts 24, delaying Paul’s trial, waiting for a bribe. So here was a man who wasn’t concerned about conscience or law, morality or justice. He was simply out to fill his pockets and to gain honor and recognition from those who were influential and held position, power, and wealth. The other character in this story is a widow who wanted legal protection from her opponent. We conclude that this widow obviously had been mistreated, and her request was just and fair. She wanted legal protection. Someone may have been trying to get her money, or to cheat her out of her land. And so, this poor, lowly widow urgently begs for justice, but since she is a widow she has nothing to offer as a bribe. Neither does she have anyone influential to speak on her behalf. She is a picture of utter helplessness. But she does have one thing. She has the ability to pester the judge. She kept coming to him. In other words, the widow continually and constantly kept approaching this judge. Leaving messages on his answering machine, constantly appearing in his office, writing him letter after letter, sending faxes. She gives him no peace - she is persistent. She wants justice! We need to be persistent in our prayers.